Enjoy an interactive and challenging 60-minute adventure with friends and family as you use clues and objects to help you escape. Each themed room at Escape Rooms Ibiza presents its own special adventure to thrill and excite everyone. Escape Rooms Ibiza invites you along to a real life escape game where you use your wits, your intelligence as you and your team work out how to escape a locked room. During your 60-minute session you will need to look for clues, break codes, look for hidden objects and solve the mysteries within. Escape room challenges are ideal for groups of friends, couples or adults and children and are proving a big hit for corporate team building. In fact, anyone who likes mysteries and being part of a team will find it fun. All the escape themes are family friendly and designed to bend your minds and bring on lots of excitement as you problem solve your way out. There are rooms based on classic tales like Alice in Wonderland or Sherlock Holmes. 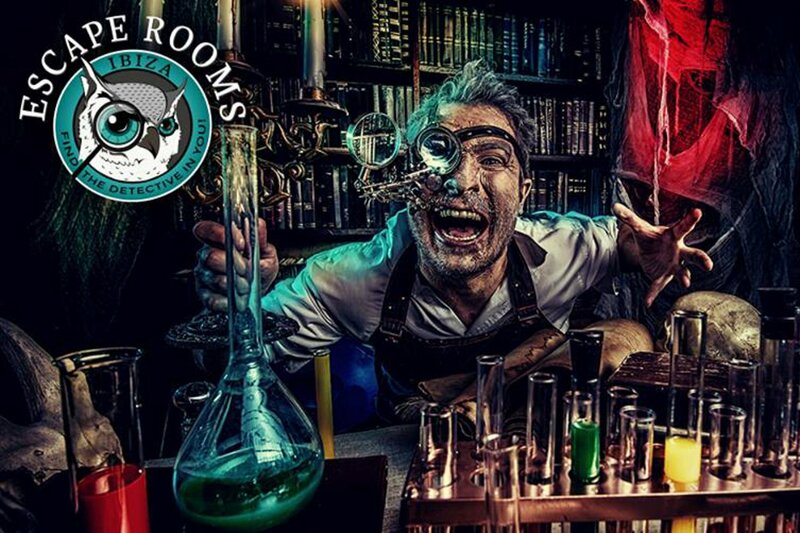 The Mad Scientist room is ideal for those that like brain teasers, whilst those looking for more of a thrill will love the horror movie style Zombie Apocalypse room. The idea for escape rooms first came from computer and video games and since then has spread across many countries worldwide, including many in Europe. The transfer from screen to real life sees all participants in a real-world physical adventure game with all kinds of themes taken from the original games as well as adventure board games and movies. Escape Rooms Ibiza is recommended for anyone who wants complete game immersion or is in search of an exciting new adventure. What better way to do that than using your wits as you battle against the clock to escape? You are guaranteed an unforgettable experience full of surprises and intrigue! These rooms are all air conditioned and centrally located in Ibiza Town on Via Punica (near Vara de Rey) and only a short stroll to a bar for a post game debrief, where you can re-live a fantastic experience. NOTE: The suggested number of people per game is between 2 and 6. If you are a large group it's suggested that you split into groups and do different games at the same time so you get the maximum enjoyment out of your adventure. No special skills or knowledge is required – just your commitment to have fun with your group. And at the first escape rooms ever in Ibiza, you will love the attention to detail and colour of these cool rooms. Location: Vía Púnica, 4, Bajo, Ibiza. Minimum age requirement: Everybody is welcome to play this game, but it is designed for players older than 12. All children up to 14 years old can participate if accompanied by an adult who is part of the team. Open every day. Reservation required. A friend and I did the "Mad Scientist" room. It was really well set up and the challenges were quite demanding. We received helpful clues when we needed and wanted support so we could keep moving forward. Close collaboration and communication is an absolute must so it's extremely interactive. A great experience, very enjoyable, entertaining and professional!